This Is Me have stated they will hold a presence in the building of The Department of Health until the promised meeting with the Minister is confirmed. News 11 April, 2019 . Written by Katie Donohoe. This Is Me, a national grassroots campaign advocating for safe, accessible, best practice standards for care to be provided to transgender people in Ireland, are today staging a sit-in at the Department of Health building on Baggot Street. This is in demand of the meeting that Minister for Health, Simon Harris TD has promised the campaigners on multiple occasions over the past 13 months. 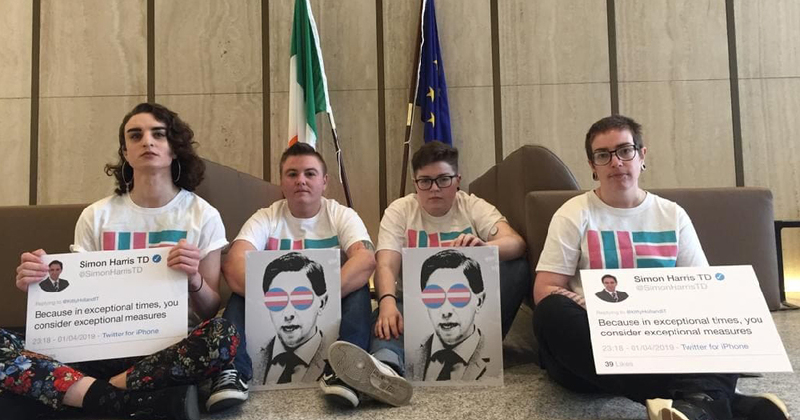 The campaigners have stated that they will continue their sit-in at the Department of Health until they receive a confirmed time, date and location of the promised meeting with Minister Harris to discuss the introduction of official provisions for transgender healthcare in line with WPATH standards of care, and will not voluntarily leave the building until this official arrangement has been made. Publicly through An Taoiseach Leo Varadkar during Leaders Questions in the Dail, July 2018. Minister Harris also committed publicly on Twitter to follow up on this meeting in November 2018. Following the campaign’s last public demonstration, July 2018, Minister Harris is also quoted in saying that he will meet with the campaign. Privately through conversation, by the request of a number of TD’s and Senators since March 2018. However, this meeting has not yet come to fruition and the Minister has not yet made contact with the campaign, despite This Is Me’s numerous attempts to communicate and proceed with the promised meeting. This meeting is sought to discuss transgender healthcare in Ireland, highlight the crisis that this area of healthcare is currently under and discuss viable solutions with those directly affected, with lived experienced and extensive knowledge in the area. One year ago, the @WHO (World Health Organization) DECLASSIFIED Trans Identities as mental health or behavioral disorders. Meaning they absolutely shouldn’t be treated as such. Despite the World Health Organisation (WHO) declassifying transgender identities as mental health or behavioural disorders 12 months ago, Ireland are still practising a strict psychiatric diagnostic model. Forcing transgender people to obtain a psychiatric diagnosis prior to being recommended for HRT (Hormone replacement therapy). This model of care is damaging, outdated and not in accordance with international best practice standards of care, which advises an informed consent model of care in line with WPATH (World Professional Association of Transgender Health). There are only 3 endocrinologists providing HRT to Trans people in Ireland. Based in Galway, Dublin and Louth. This is despite the fact that GP’s provide HRT to cisgender people on a daily basis. This treatment is not restricted and GP’s are fully capable of providing it to all patients in need, regardless of gender identity. In order to be referred to one of the three endocrinologists, a person must first obtain a psychiatric diagnosis (two in some cases) of ‘gender dysphoria’. WPATH is intl best practice standards of care for trans healthcare. They recommend an informed consent model. In Ireland, we use a dangerous, outdated psychiatric model. There are only a limited number of psychiatrists providing this diagnosis, meaning that waiting lists have now soared to 28-33 months on average. There has also been an increase in Trans people being refused treatment based on a psychiatric evaluation of their outward appearance, relationships, familial support and progression of social transition. These people are then not being provided with any mental health supports following the refusal of treatment. In Ireland, there are currently no surgeons who provide gender affirmation surgery, forcing Trans people abroad for major, invasive and personal procedures, with little to no aftercare once they return home. 11 April, 2019 . Written by Katie Donohoe.